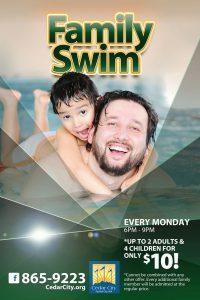 The Family Night Swim Series is a program where families can get a discount price on Monday’s at the Cedar City aquatic center pool. The price is only $10 for up to 2 adults and 4 kids! Family Night is every Monday from 6:00 pm to 9:00 pm. Every additional family member will be admitted at the regular price. Enjoy swimming, the water slide tube, the lazy river, the playground structures and a hot tub! This event is on our calendar.